The West Coast connects to the world through its ports. Ships have been the economic lifeblood of the West Coast since the early 19th century, and the ports where goods and people move from water to land and from land to water have keyed important parts of the the history of this region. Sadly, we note the passing of the great waterfront historian, Ron Magden, whose writings, photos, films, and document collections are at the heart of the Waterfront Workers History Project. 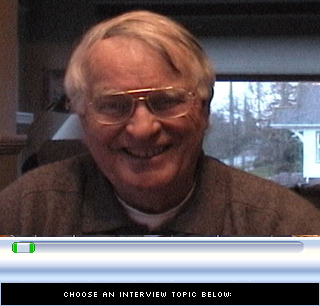 Above: Ron tells his life story and narrates key moments in waterfront struggles in a video interview from 2008. And here is more about his writings and films. Special section on the 1934 strike includes a film, a slide show, scores of photographs, digital copies of the Waterfront Worker and over 600 news articles, and a detailed narrative history. Harry Bridges Videos: Founder and ILWU president Harry Bridges was one of the outstanding labor leaders of the 20th Century. Here are videos from two different decades, a 1950 newsreel and his 1986 Local 23 speech commemorating the 100th anniversary of longshore unionism in Tacoma. Leaders of the Cannery Workers and Farm Laborers union photographed in 1934. Two years later President Virgil Duyungan (left) was assassinated. See Cannery Workers and their Unions. The Waterfront Workers History Project explores this vital history, focusing on the men and women who have worked in the ports, the inland waterways, the fisheries, canneries, and other waterfront industries of California, Oregon, Washington, British Columbia, and Alaska. Strikes and struggles for workplace rights have been part of that history and waterfront workers have created some of the most influential labor unions anywhere, including the International Longshore and Warehouse Union (ILWU). This multimedia website includes several short films and video oral histories. Here are hundreds of rare photographs and important documents, an online archive of union publications. The site is organized by industry, with separate sections for longshore workers, maritime workers, cannery workers, shipyard, and fishing workers. In addition there is a special section on Harry Bridges and one on the 1934 coastwide longshore strike. Finally, we are pleased to recognize the work of historian Ron Magden, whose writings and collection of documents and photographs anchor this project. Here are more than 300 photographs of waterfront workers and union activities from the collections of Ronald E. Magden, Local 23, Jean Gundlach, Ross Rieder, Jerry Tyler, and Lonnie Nelson. Included here is a complete digital collection of the Waterfront Worker, published from 1932-1936, courtesy of the ILWU Archives. In addition we have digitized more than 600 newspaper articles covering the 1934 Waterfront strike. You will also find important newspapers and documents from the Cannery Workers and Farm Laborers Union that began in 1933 and is now affiliated with the Inlandboatman's Union (ILWU). 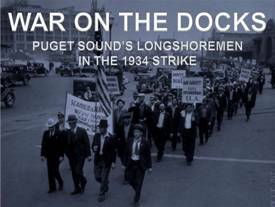 Here you will find an important collection of videos, including a 20 minute film about the 1934 Longshore Strike with rare original footage of events in Seattle and Tacoma. Also watch several videos of Harry Bridges's newsreels and speeches. Watch brief videos of Nikki Bridges, Martin Jugum, Judge Jack Tanner, Jean Gundlach, and others. For more than forty years, historian Ronald Magden has documented the history of waterfront workers in the Puget Sound area. His books, oral histories, and and collection of irreplaceable union records make this project possible. Here is a video interview with Ronald Magden, a guide to his collections, and digital copies of many of his books, articles, photographs, and films. This special section features films, interviews, photos, documents, and a detailed history of the 1934 strike that won the waterfront and lead to the formation of the ILWU. Fish processing and canning have been key West Coast industries since the middle of the 19th Century. 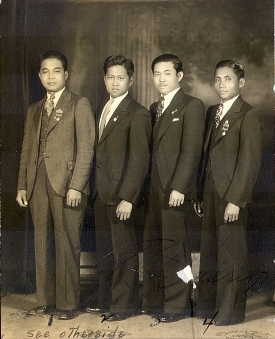 The first enduring attempt to unionize the industry began in the 1930s and was led by Filipino workers. This unit explores the history of the cannery union activism and the Filipino-American community. Here are video oral histories with activists of two different generations, research essays that detail the history of the union, and several collections of rare photographs, documents, and digitized newspapers. The 1948 strike was a surprising victory for the ILWU. Defying the Taft-Harley Act and the red-baiting strategy of employers, the union secured its future. This award winning article is the most complete account of the strike. This prize winning five-part study details the history of the CIO union that organized fishermen and cannery workers from Alaska to San Diego. By the late 1940s IFAWA represented over a third of the West Coast workforce. It was the largest and most successful fisherman’s union in American history. At the intersection of land and sea is the hard and critical work of longshoring. In this section you will find historic photos and video of longshore work and workers, a timeline and interactive map, special sections on ILWU president Harry Bridges and the 1934 Strike, and links to related organizations and institutions. Sailors and other seafaring workers built some of the earliest unions on the West Coast. Here are historic photos and short articles about the Sailors Union of the Pacific, Marine Cooks and Stewards, and Marine Engineers Benevolent Association. The West Coast fishing industry has a lore all its own. Fishermen from Alaska to southern California brave dangerous waters and often have to fight for basic employment rights. Fishermen created a variety of associations and unions, including the International Fisherman and Allied Workers Union (CIO) . This special section hosts links and resources about rank and file leader and ILWU president Harry Bridges. Here you will find historic footage of Bridges as well as later interviews with him and lifelong colleagues, a collection of photographs, and a brief biography of one of the most important labor leaders in US history. An annotated guide to printed and web resources for learning about waterfront workers history. Learn more about the Waterfront Workers History Project, its staff and contributors. Here is also copyright information.